Another week draws to a close, and another delicious recipe awaits! 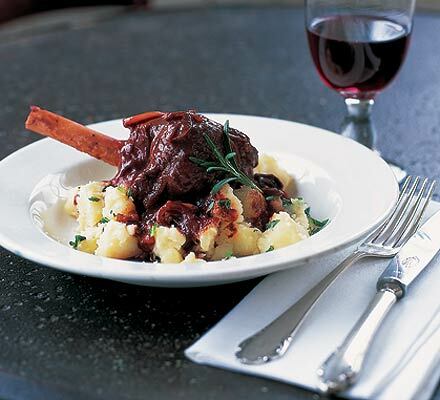 I’m a BIG fan of lamb shanks, so I thought I’d share this recipe this week – from the BBC Good Food site. When meat is slowly cooked off the bone, all kinds of goodness are released – and whilst this meat may appear to have a little more fat on it than your leaner cuts – this fat is excellent for you, your gut and your hormones! This week I visited Trupp Cooking School, where I had the pleasure of watching two great foodies at work (this husband and wife team is amazing. Walter is the Chef and Dorota his wife is a Nutritionist). More on that down the track – what I want to share with you quickly now is how Walter made the most amazing stew – and then cooked us up a plate of nourishing marrow! Dorota shared on just how healing these fats can be on the gut – especially in those of us with terrible digestive issues. You can check out their classes here. Remember – the gut is the pivot of our health. If our digestive system is happy, the rest of the body just works. Now for the vegetarians amongst us, never fear – you can always make a vego version! Instead of shanks, chop up all your favourite veggies instead and let them slowly cook their way to goodness. Dust the lamb shanks with flour and season. Heat a casserole and add a little butter and olive oil. Add the onions and cook until soft, then scoop out. Put in the lamb shanks and brown all over. Put the onions back in the casserole with the garlic, balsamic, wine, tomato purée, rosemary and season. Cover, put in the oven and cook for 2 1/2 hours until the meat is almost falling off the bone. Remove the lamb from the casserole and keep warm. Boil down the juices to thicken them if they seem too thin. Meanwhile, boil the potatoes until soft. Drain, add a knob of butter, thyme, mint, then season and crush lightly. Serve with the lamb shanks and gravy.